Do you wanna OSMfight today? : Neis One! Do you wanna OSMfight today? I am very sure you have some ideas for further fights, don´t you? Yeah, you’re right, thanks for the quick fix. I guess it would be just a minor change, because the statistic probabillity having the same statistic should be pretty low, but would be nice to have it implemented correct. Thanks in advance, keep up the good work! Hahaa :)) this is very funny, i was at work and me and my friend from work have websites, and we calculated who wins if someone searches for our domain name. You forgot to post your osm nickname. This website leaves out the quality of the contributions, as represented by the mean of the taggs added per object. I could also map the buildings of the the whoole world using only building=yes, as tag, even if e.g. the roof shape could also be tagged from Bing, but this brings no further points on odbl.de (which is not a real user stat site in this kind) or this website. If I want to make some points her or on odbl.de, I can also map the landuse from Bing using as most nodes als possible. But this does not help OSM nor is it a representation of the real data quality. The number of object per user should so e.g. multiplied with the mean of the taggs added, which would better represent a user’s contributions. BTW, might it be possible to extend the battles on a few more aspects? I like your ideas and agree that further “rounds of fighting” might be interesting. But I think we have several problems if we do this: (1) Do I have easy access to this information? (2) Is the OSM user name equal to the wiki user name, SVN user name … ? is “SveLil” your OSM user name? Do you know this site: http://hdyc.neis-one.org/?SveLil ? Sadly the created and touched stats are depending @ the full history dumps 🙁 The data date can you see at HDYC. I think you did a lot of contributions in the last weeks (after 2011-06-19). Is this correct? That’s the site, I got the stats from, and yes, I restarted mapping just recently. 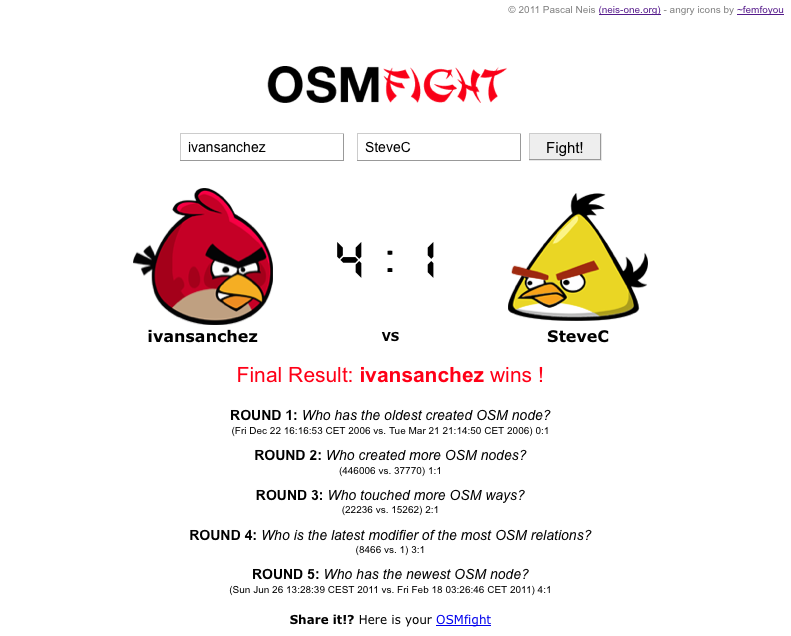 I think my friend Brian found a bug in the OSM Fight. 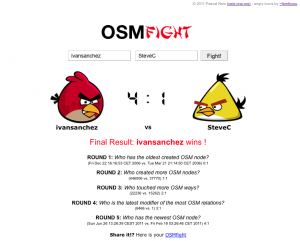 Compare http://osmfight.neis-one.org/?u1=jaakkoh&u2=worldwidewolford and http://osmfight.neis-one.org/?u1=worldwidewolford&u2=jaakkoh … Same usernames fighting in different order => different result… Magic? yes, it was a Date parsing error, caused by the latest “How did you contribute to OpenStreetMap”-update. Thank you very much 4 reporting!